JOHAN HELMICH ROMAN (1694-1758): Flute Sonatas Nos. 6-12, BeRI 207-212. Description: Published in 1727, these generally light and airy pieces, in four to six movements and full of attractive melodies, are much closer to the new rococo style than to the complicated and busy extravagances of the high baroque. We offered a complete Brilliant Classics recording of all 12 six months ago but, since BIS is apparently embarking upon a Roman series and since the Brilliant release used a transverse flute and BIS uses a recorder, we also make this new release available. 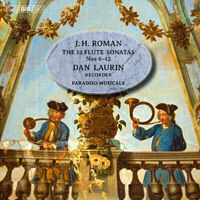 Dan Laurin (recorder), Paradiso Musicale (harpsichord, cello and baroque guitar).